Be a part of the ground breaking guitar festival and exhibit your wonderful guitar masterpieces. 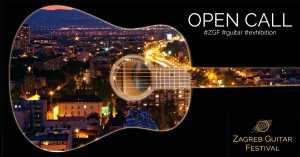 The 4th Zagreb Guitar Festival offers a space for showcase of guitars and guitar players equipment. The exhibition will be open during the whole festival, held from 3rd to 8th April 2018. If you are interested please contact us at info@zagrebguitarfest.com.